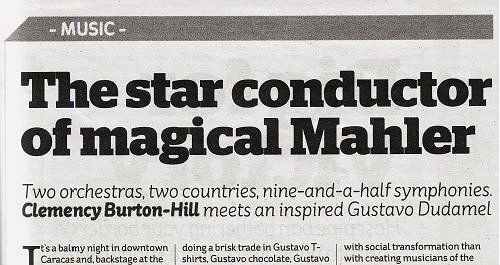 Yesterday's Independent carried the gushing feature seen above written by Clemency Burton-Hill on location in Caracas with Gustavo Dudamel and laced with generous quotes from the president of the Los Angeles Philharmonic. Ms Burton-Hill is better known as a presenter on BBC Radio 3 and the Proms, and also of the current BBC Four Young Musician 2012 programmes. What the feature byline does not explain is that one of her other roles is writing promotional material for artist agent Askonas Holt. 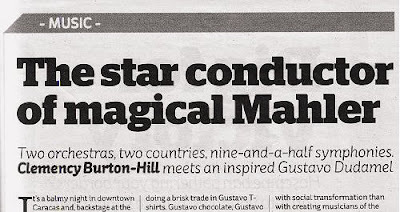 And it also does not tell readers of Askonas Holt's role in Gustavo Dudamel's forthcoming UK tour with the the Simón Bolívar Symphony Orchestra of Venezuela and in his past Los Angeles Philharmonic tours, all of which feature prominently in the Independent article. A search reveals no less than twenty-five contributions by Clemency Burton-Hill to the Askonas Holt website, while on the Dudamel/LA Phil tour page there is a glowing write-up by.... Clemency Burton-Hill. As the paper is called the Independent is it unreasonable to ask why the recent blog post headlined 'Dudamel is not the savior of classical music' by Alex Ross, a commentator of infinitely greater authority than Ms Burton-Hill, was not discussed in the editorial feature? The sad thing is that Gustavo Dudamel does not need this shameless media manipulation, because, as Alex Ross quite rightly points out, he is "a greatly gifted musician, with room to grow". All Clemency Burton-Hall's hagiography does is remind us that El Sistema has more than one meaning. Presumably Ms Burton-Hill is required to declare her interests on a register of interests which the BBC requires its contractors and employees to complete? I would also expect that CB-H does not broadcast on any concerts or recordings which feature any of her clients. Otherwise, next time we hear that so-and-so's performance was "marvellous" or "wonderful" or "probably the finest ever heard" we might have to doubt the presenter's objectivity. "What the feature byline does not explain is that one of her other roles is writing promotional material for artist agent Askonas Holt." "Mahler's Third Symphony is not a piece to be trifled with, though Bychkov's performance was anything but a trifle. Nothing was sensationalist or pandered to neurosis. The orchestra was allowed to inhale and exhale, with the last three movements emerging as one magnificent ascent to glory." This is not a review, of course. But I would interested to know exactly what payments (and from whom) the writer of this is receiving to report in such glowing terms a concert which received mixed reviews elsewhere. Say the improbable were to arise, i.e. Franz Welser-Möst invite me to accompany him to Wiener Staatsoper rehearsals and auditions - well, I can safely write here that this would never be offered on a paid basis, but if otherwise then I would at least make some tongue-in-cheek remark about my critical independence. Similar clarity in this Bychkov case would be highly interesting. I have invited Gavin Plumley, who wrote those words about Semyon Bychkov's Mahler 3 on his personal blog, to respond to the comment above. I have not and will not be receiving payment for the Stalking Semyon project. I think that Bychkov is an engaging artist and the opportunity to observe him working with the LSO, at the Royal Opera House and finally at the Royal Academy was enticing enough. While my blog is an adjunct to (and to some extent) a shop window for my paid freelance work, the site itself generates no money (other than minimal Amazon associate link revenue). I find it is not always clear in your posts what is being packaged for the shop window. You refer from time to time to liner notes you write, but not in the body of your CD reviews. I don't have a problem with the reviewing per se, but feel that any involvement with the project should be noted here as a matter of course, and particularly when it is an ongoing commercial relationship. Which I believe your Schubert/Padmore notes are (?). This B-H case is more egregious, but the problem is the same. Let's presume that we can find her declaration of interest on a register somewhere - but what use is that? Her AH interest should be declared in each and every article she pens about an AH client.